The Texas Baptists Evangelism Team exists to challenge, equip and train Texas Baptists churches, by the power of the Holy Spirit, to passionately fulfill the Lord’s call to share the Gospel of Jesus Christ. The Evangelism team provides an array of resources and conferences for Texas Baptists to equip themselves with tools in sharing the Gospel. 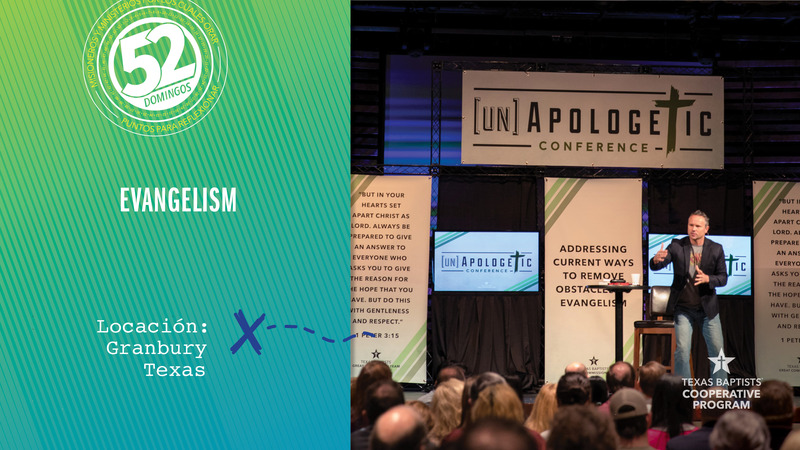 One such conference is the [un]Apologetic Conference, which addresses current ways to remove obstacles in evangelism, and helps individuals strengthen their faith and learn how to engage others with the Gospel. Mark Forrest, lead pastor of Lakeside Baptist Church, in Granbury, commented that many of his church members and their friends attended the event and were given the opportunity to ask challenging questions. Because of generous gifts made to the Cooperative Program, we support ministries like the Evangelism Team that help equip churches with the resources to reach people and share the Gospel. Today, let’s pray over the people in our lives that need to be reached by the Gospel. Pray for the Evangelism Team as the Lord continues to make an impact through them by providing resources in evangelism.